This summer I have been visiting the family estate at Gateshead, the harsh boarding school Lowood, and the Gothic mansion called Thornfield Hall through the audio download of Charlotte Bronte’s Jane Eyre courtesy of SYNC YA. This free audiobook uses Overdrive software which is on both my computer and my mobile phone. 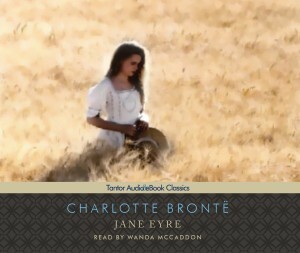 As the recording of Jane Eyre is about eight hours long, the ability to move from device to device has proved most helpful in finishing the book. This is not my first experience with this novel. I read the book when I was a teenager, and, like Jane, I fell in love with Mr. Rochester. Years later, I taught the book later to Advanced Placement students and marveled at Jane’s independence, her morality, and her ability to emphatically say “No” to the persistently persuasive Rochester. Now, I am struck by Jane’s role as a governess and how Bronte characterizes attitudes towards that profession in Victorian England. Not that I ever suffered much from them; I took care to turn the tables. What tricks Theodore and I used to play on our Miss Wilsons, and Mrs. Greys, and Madame Jouberts! Mary was always too sleepy to join in a plot with spirit. The best fun was with Madame Joubert: Miss Wilson was a poor sickly thing, lachrymose and low-spirited, not worth the trouble of vanquishing, in short; and Mrs. Grey was coarse and insensible; no blow took effect on her. Blanche’s condemnation of those who tried to educate her backfires; Bronte’s desire to have the reader dislike this rival for Rochester’s affection is deliberate. Jane’s quiet moral intelligence wins out in the end. Listening to the story, I considered that Bronte was making a case for the importance of education as a means to rise out of poverty. Jane’s education at the Lowood Institute, a boarding school, was hazardous and purchased at a terrible price. Her classmate, Helen, dies because of the stark conditions at Lowood, mirroring the real-life death of Bronte’s sister, Maria, who died from tuberculosis contracted because of hunger, cold, and privation at Cowan Bridge School. Despite the treacherous conditions, however, Bronte revisits the theme of education’s importance as it provided the character Jane with an independent profession. She is hired to teach Rochester’s ward Adele, and she proves to be a successful governess. The average primary-school teacher in the United States earns about 67 percent of the salary of a average college-educated worker in the United States. The comparable figure is 82 percent across the overall Organization for Economic Cooperation and Development (O.E.C.D.). For teachers in lower secondary school (roughly the years Americans would call middle school), the ratio in the United States is 69 percent, compared to 85 percent across the O.E.C.D. The average upper secondary teacher earns 72 percent of the salary for the average college-educated worker in the United States, compared to 90 percent for the overall O.E.C.D. Given the opportunity costs of becoming a teacher instead of using your college degree to enter another, more remunerative field, are the psychic rewards of teaching great enough to convince America’s best and brightest to become educators? Over 150 years after Charlotte Bronte’s novel, the teaching profession still has its critics; there are real life Mrs. Ingrams and Blanches who hold the profession in contempt. There are also economic drawbacks to choosing the profession, as demonstrated in the O.E.C.D poll. In the 21st Century, the teaching profession should be desirable to those who aspire to teach, but who, like Jane, want to be financially independent. Teachers should not have to wait for a Mr. Rochester in order to prosper.